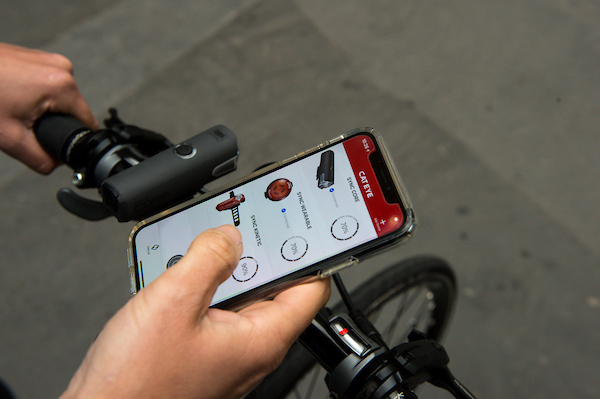 Touring the Friedrichshafen halls revealed that the future of bike consumer electronics is smart, with lights being integrated into stems, handlebars or helmets, and APIs being built into Google Maps enabling lights to work as indicators, showing traffic the rider’s intended direction. Wearable commuter lighting was rife, from fully integrated hi-tech lighting garment designs to simple, effective ideas such as using a phone as a light, positioned perfectly in a specially-made jersey pocket. Over recent years, Eurobike’s exhibitor list has reflected the dramatic rise of e-bikes, first grabbing headlines as an emerging market, then diversifying in styles and eventually owning over 50% of the overall square footage. It’s interesting to see how the e-bike market continues to mature. We often look at bikes through the passionate lens of sport – or at least granfondos, club rides or fun with friends – but an aspect of the eBike phenomenon is that it’s mobilising new, old or returning riders, enabling eco-friendly commuting and opening up whole new avenues, such as uses in factories, for deliveries, and even with integrated tents! It doesn’t matter if you ride road or mountain bike, pedal-power or electric: a good helmet is vital to staying safe – and its performance is equally highly regarded by many riders. Both of these factors were front and centre at Eurobike. The main safety trend is the widespread adoption of the MIPS (Multi-directional Impact Protection System), a “slip-plane” technology to reduce rotational forces that can result from certain impacts. It has existed for a few years but now features on a vast number of helmets. Beyond safety, today’s road helmets typically answer two main requests: to be faster and weigh less. 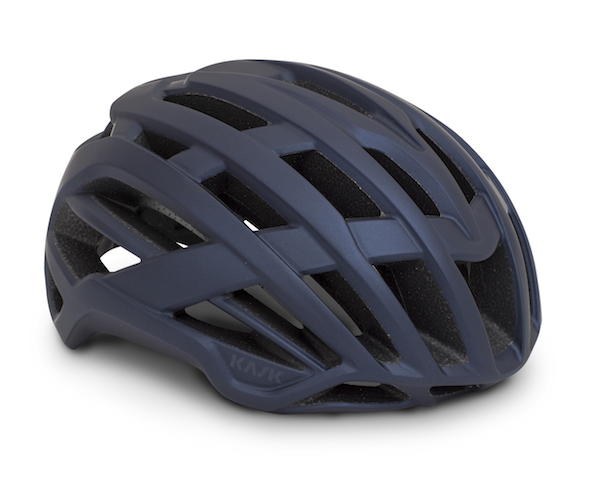 Beyond that is the requirement for ventilation – ideal for long summer climbs. “Many models showcased lightweight, aerodynamic helmets. Our favourite is the new KASK VALEGRO with 37 vents,” says SHIFT’s Dario Esposito. We also saw specifically designed urban eBike helmets, and smart helmets equipped with turn signals, brake functions, Bluetooth music technology, position and impact sensors and automatic lights. Indoor trainer brands have been innovating with new products and lineup upgrades, and were showing them off to the industry in Friedrichshafen. WAHOO had multiple products on show, including the KICKR HEADWIND; a smart fan with over 30mph of wind speed, activated by either your speed or heart rate. Tacx brought their Neo Smart Bike again (having debuted it in 2017). A self-powered smart trainer, it makes great use of the power generated – it seems crazy that no other brand has done this yet. Also related to indoor training was Zwift’s major new release which was teased at Friedrichshafen. The latest update, coming later in the year, will allow riders to take a spin around New York’s Central Park. Ride on, NYC style. Is the future of drivetrains Driven? 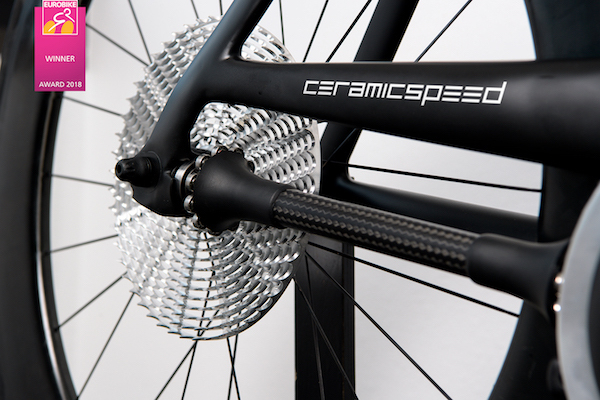 One of the most hotly discussed products displayed at Eurobike was Driven, the new concept drivetrain from CeramicSpeed. At the start of 2017, CeramicSpeed set about the challenge to find the most efficient drivetrain imaginable, working in partnership with the Mechanical Engineering Department at the University of Colorado. The result is a system that uses a drive shaft in place of the chain and derailleur and according to tests by CeramicSpeed, has 49% less friction than the Shimano Dura-Ace drivetrain. Whether this system is ever brought to market is still to be seen, it is still very much a prototype and proof of concept but it seems to have captured the interest of the cycling industry and won CeramicSpeed a Eurobike design award. As brands constantly look to evolve how we use and think about componentry on the bike, Driven is definitely one to keep an eye on.